This is the fourth of the exercises tied to the interpretation of seismic data and unlike the previous two exercises concentrates on the seismic response of carbonate sediments. The objective of this exercise is to interpret the sequence stratigraphy of the Neogene carbonate section displayed on a seismic line across acquired by Western Geophysical on the northwest corner of the Great Bahamas Bank, just west of the coast of Andros Island (Eberli and Ginsburg, 1987). The geological setting of the exercise is the Great Bahamas Bank, which overlies part of the edge of the North American continental crust and the adjacent oceanic crust of the Western Atlantic (Pindell 1985). The Great Bahamas Bank was initiated by the accumulation of a mix of siliciclastic, carbonates and evaporites in the Late Triassic and Early Jurassic but most of the sedimentary fill is from the Jurassic to Holocene is composed of carbonate sediments with the thickest sections occuring in the Cretaceous and Tertiary (Eberli and Ginsburg, 1987). The exercise concentrates on the study of the geometric relationship of carbonate sequences expected in the shelf, reef crest, slope and down slope basin floor fans to local changes in base level. In the Bahamas these changes in base level were probably driven by a combination of tectonic movement and the Neogene eustatic signal preserved in the stratigraphic record of these carbonate rocks. The inference from seismic, gravity, magnetic, and well data is that the northwest Bahamian platform is on the edge of the North American continental crust, while to the southwest it is situated over oceanic crust (Pindell, 1985). This is supported by seismic and magnetic data which indicates that the approximate depth to the source of magnetization in the southeastern Bahamas is at about 10 km (Bracey, 1968; Drake et al., 1963; Sheridan et al, 1966; Talwani, 1960; Uchupi et al., 1971; Pindell, 1985). Similarly, gravity data indicates that the depth to the mantle is about 12 km beneath the Atlantic abyssal plain adjacent to the platform; it is about 20 km beneath the southeastern Bahama platform; and about 30 km beneath the northern Bahama platform (Houtz & Ewing, 1964; Talwani, 1960, Uchupi et al., 1971). In the southeastern Bahamas, where the crust is only about 10 km thick, though most of it is made up of carbonates it is much too thin to be considered normal continental crust. In contrast, to the northwest, the section interpreted as sedimentary approaches continental thickness. Similarly regional seismic profiles suggest that the depth to oceanic crust increases from the adjacent abyssal plain toward the edge of the Bahama escarpment (Ball et al., 1971; Uchupi et al., 1971). Parallel to, and east of the present Bahama Escarpment, seismic, magnetic and gravity data suggest the presence of a deeply buried scarp feature in the oceanic crust. Uchupi et al (1971) point out that the trend of the buried scarp, which they interpret as related to a fracture zone, is exactly on a small circle for spreading in the north Atlantic, with the pole of rotation at 65oN, 12.5oW. Magnetic anomaly patterns to the east are perpendicular to the fracture, suggesting the possibility of a ridge-ridge fracture pattern as the possible origin of this feature. This idea is enhanced by the lack of fit for the platform in a sea floor spreading reconstruction of the Atlantic (Dietz et al., 1970). Based on a modified Bullard reconstruction of the closure of plate boundaries to before the development of the Atlantic Ocean (Bullard et al., 1965; Dietz et al., 1970), virtually all of the Bahamas overlap onto the African continent and its continental shelf. Deitz et al., (1970), Uchupi et al., (1971), Le Pichon and Fox (1971), Glockhoff (1973), and Sheridan (1974 a&b) all subscribe to the theory that the Bahama platform developed over oceanic crust, and that this development occurred during the earliest phase rifting and sea floor spreading that eventually created the Atlantic. Pindell (1985), in contrast, is of the opinion that much of the Bahamas is underlain by attenuated and intruded pre-Mesozoic crust. 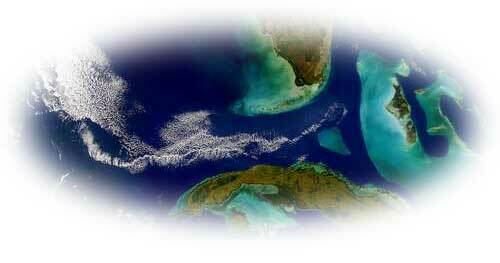 He includes the western half of the Bahamas in a plate he calls the Florida Straits Block. It is because in plate reconstructions with the present Atlantic closed the crust of the Florida Straits block overlaps Africa that Pindell (1985) proposes that this plate must have migrated from a position in the eastern Gulf of Mexico. During the Jurassic, asymmetric rifting separated North America from Europe, Africa and South America forming a narrow isolated basin that could have been similar to the present Red Sea. A comparable model would be the Gulf of Mexico or possibly the Mediterranean. Gravity models indicate evaporites (or similar material) are included in the sediment stack and account for the gravity values for the region. This basin nearly filled to sea level over a period of 15-20 million years. carbonate sedimentation began on localized basement highs, and perhaps over shallow portions of the oceanic ridge beneath the southeastern Bahamas (Uchupi et al., 1971). Like Pindell (1985), Meyerhoff and Hatten (1974 a&b) argue that the Bahamas are underlain by continental crust. Mullins and Lynts (1977) agree and suggest any crustal overlap in plate reconstructions can be taken care of by rotating the Bahamas area 25 degrees to the northeast during Cretaceous or early Tertiary time, in response to motion of the Caribbean plate. Once initiated, the production of shallow water carbonates at the surfaces of the shallow platforms was able to keep pace with continued subsidence of the oceanic crust and the ever-increasing weight of the carbonate section. Following the initial period of asymmetrical crustal attenuation, shearing and continental basin filling in the Late Triassic, symmetrical oceanic spreading then began in mid Jurassic time, about 170 MY BP (Pindell, 1985). This carried the Bahama platform westward on the trailing edge of the North American plate, and completing development of the ridge-ridge transform fault along the eastern margin of the complex. Several features that might be expected in the structure of a carbonate platform are seen in a seismic refraction profile made by the University of Miami (Ball et al., 1971). This lies seaward of Cat Island on the eastern side of the Great Bahama Bank and seaward of Exuma Sound. It exhibits travel times at depths that are consistent with what should be expected of a thick carbonate platform . Lithologic interpretations coupled to travel time velocities (from seismic refraction profiles) were: 2.0-2.5 km/sec = unconsolidated sediments; 4.7 km/sec = consolidated Cenozoic to Upper Cretaceous carbonates; 6.1-6.5 km/sec = consolidated Mesozoic carbonates and basement rocks; 8.1-8.3 km/sec = upper mantle. These data suggest that beneath the Bahama platform, the mantle plunges abruptly to near continental depths. Also, the inferred top of the Lower Cretaceous is clearly depressed beneath Exuma Sound, indicating structural down-drop within the basin. Several reflection profile studies have revealed folding and faulting of the sediments of the Old Bahama Channel, adjacent to Cuba (Sheridan et al, 1966; Uchupi et al, 1971). Pindell (1985) records that the southern margin of the Bahamas was imbricated in the Paleogene into thrusts when Cuba collided with it. This may be correlated with shallow seismic activity along the trend of Cuba. Not only that but reflection profiles also reveal folded and faulted sediments in the Tongue-of-the-Ocean, Exuma Sound, and Columbus Sound (Ball et al., 1971). The faults may displace the present sea floor, and suggest sedimentation rates two to three times less than the up-thrown platforms. Clearly these faults are active at the present time. Combined with the negative Bouguer gravity anomalies for re-entrant areas (Talwani, 1960), these observations indicate a basement structural control on the position of the deep re-entrants; moreover, down-drop along these features is still going on. The sedimentary history of the Bahamas from Late Triassic times is determined from a combination of seismic profiles and wells. Only a few deep well tests have been drilled within the Bahama area (Andros 1, Long island 1, Great Isaac 1, and Cay Sal IV-1) to the Jurassic (Meyerhoff and Hatten, 1974 a&b), while a number of shallow water wells have been drilled by the Bahamian Government and three by the University of Miami (Beach and Ginsburg, 1980). Off platform, a series of wells have been drilled and cored by the Deep Sea Drilling Project and the Ocean Drilling Program (Hollister, Ewing et al., 1972, and DSDP Scientific Party, 1985). Deep dredgings have collected limestone from the bank margin (Freeman-Lynde, 1981; Corso, 1983; Schlager et al., 1984; and Freeman-Lynde and Ryan, 1985). Much of these data suggest the Mesozoic sediments of the Bahamas are largely shallow water carbonates with some evaporites. The well drilled on Cay Sal Bank to the west of the Great Bahama Bank bottomed in Upper Jurassic shallow water carbonates at 5700 meters. The well at Great Isaac passes through Jurassic shallow water carbonates and black shales and penetrates Triassic arkosic volcano clastics, the oldest section seen in any of the wells (Tator & Hatfield, 1975). The well at Long Island bottomed in Upper Jurassic shallow water carbonates at about the same depth as Deep Sea Drilling Project site 100, which was drilled in the abyssal plain just to the east. DSDP cored the contact between the sedimentary section and underlying oceanic crust. Here, late Jurassic (approximately 160 Ma) Oxfordian argillaceous carbonates immediately overlie basaltic pillow lavas (Spencer, 1967). Probably, the best studied published core data comes from the Andros Island well Number 1, which terminated in Lower Cretaceous shallow water carbonates with a T.D. of 4446 meters (Spencer 1967, and Goodell and Garman, 1969). The uppermost 15-20 meters of the Andros cores consist of oolitic sediments while the rest is composed almost entirely of pellet muds similar to those accumulating on the present platform interior. Mineralogically, the cores show a series of gradations of limestone to thick dolomite. For instance, sediments are 100% limestone in the upper 20 meters of the section, and increase in dolomite content downward, with 100% dolomite being reached at 120 meters. Four such sequences of thin limestone and thick dolomite units are found in the cores. The dolomitization began initially as a micro-crystalline replacement fabric (replacing both matrix and pellets). Crystal size in the dolomite units seems to increase downward. Where solution of microfossils has occurred, coarser dolomite spar fills fossil molds. Fractures are quite common in the section, and are often filled with coarse dolomite spar (Goodel and Garman, 1969). Relative to other carbonate regions there is less published on the generation of the various fabrics and mineralogies in the Bahamian cores. Using sections in Cuba, Goodell and Garman (1969) correlate the top of the limestone units with periods of orogeny and/or exposure. These authors account for the dolomitization through the "cannibalization" of magnesium from the surficial limestones, together with downward reflux of Mg-rich brines. Other hypotheses, including dolomitization in a mixing zone between fresh and salt water are equally plausible. McNeill and Ginsburg (1988) have utilized magnetostratigraphic dating to determine the age of Cenozoic carbonates and their rates of accumulation. They re-examined old core data from San Salvador Island and determined the depth of magnetic reversals in the late Cenozoic shallow-water carbonates which they then compared to data from two cores taken on Andros and Williams Islands. These results have provided new data and dates that could revolutionize our concepts of bank development. Their cores record the upper section of the Gauss chron, the reversed Matuyama, and the normal Brunhes. The late Eocene section, which was previously dated with only a generalized biostratigraphic age, is now dated at between 36.5 and 37.5 Ma (chron 15 and 13r). The magnetic minerals they found in the Bahamian carbonates are thought to be biogenic in origin because of their similarity in size (0.04-0.3 µm), composition (magnetite), and crystal morphology to biogenic magnetite. McNeill and Ginsburg (1988) have applied this approach to recrystallized and dolomitized carbonates, providing a new means for more precise dating of the changes in the late Pliocene Bahamian reef-rimmed atoll to a flat-topped bank. They were able to date the last occurence of numerous mollusks and corals. They plan to determine rates of sediment accumulation in different bank settings as more core data becomes available. Another possible use of this method is to collect samples from the extensive cave systems that exist in the Bahamas. The McNeill and Ginsburg (1988) data indicate that the Pleistocene/Pliocene contact should be at about 42 m (135 ft) on Andros Island, a depth easily attainable by scuba diving. Off San Salvador they put the Pliocene/Miocene boundary at about 115 m (380 ft), a depth that the small submersibles used by the CMRC can reach. It is interesting to note that the 115 m (380 ft.) depth level corresponds to the depth at which karstification and caves have been observed off Lee Stocking Island, Long Island in Exuma Sound, and New Providence Island in the Tongue-of-the-Ocean. We hope this magnetostatigraphic dating technique can be used for precisely oriented and located samples from Normans Pond Cay Cave. 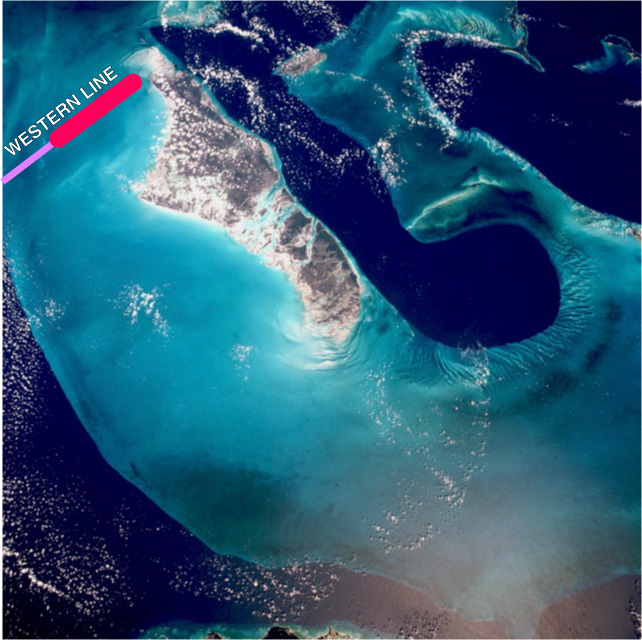 Eberli and Ginsburg (1987) have published and interpreted a series of seismic lines for the northwestern portion of the Bahamas Bank. They suggest these lines indicate that in the Late Cretaceous/Early Tertiary the northwest Great Bahama Bank was segmented into three smaller platforms that were separated by re-entrants that later were filled by bank top and slope sediment that prograded from east to west. Interestingly, the western margins were smothered by abundant sediment with an eastward source while they interpret the eastern margins of the platforms as the site of reef growth. A relationship to the prevailing easterly winds and a high-energy exposed reef encrusted margin is indicated. Sediment produced by a growing reef system and to its lee would presumably have been carried to the leeward margin of the bank to create this prograded leeward margin. However the greatest proportion of the leeward prograding sediments were probably composed of peripelagic oozes and turbidites. Eberli and Ginsburg (1987) relate the origin of the now buried re-entrants to a combination of block faulting coupled to climatic and eustatic stress which temporarily turned off or slowed carbonate production, initially starving the graben of sediment. Though no seismic lines for the Mid-Jurassic, Early and Mid-Cretaceous have been published, it seems likely that the pattern of re-entrant and bank morphology recognized by Eberli and Ginsburg (1987) for the Late Cretaceous and Early Tertiary probably existed then too. This pattern of bank segmentation, starvation, progradation, and fill is supported by Leg 101 ODP results (Leg 101 Scientific Drilling Party, 1985 a & b) arguing against the hypothesis that the Bahamas have remained a single megabank through their history. It is important to realize that a tremendous amount of sediment must have been produced in shallow water to fill these ancient re-entrants and that submarine processes were extremely active in removing bank top production into deeper water. It is also important to note that this is a period of time when the seas were extremely productive. The closing of the deep water connection of the Atlantic and Pacific through Central America in the early Miocene caused the northward deflection of the North Atlantic Equatorial Current and intensified the Gulf Stream (Keller and Barron, 1983). It probably also increased the upwelling of carbonate charged waters along the eastern margin of the Bahama limestone platform as well and thus increased their ability to support a larger carbonate producing community of organisms. This could help explain why there was a dramatic increase in productivity and the resulting filling of the ancient re-entrants during the Middle Miocene. The period when prograding seems to be most active, was a time when extensive beds of phosphorite were also deposited along the continental margin of the east coast of the U.S., in particular in northern Florida (Riggs, 1984) indicating a local increase in the nutrient content of the waters. This was the time when the largest shark ever (over 20 m-long, Carcaridon megalodon ) swam Miocene waters throughout the Tethys seas. To maintain its size at the top of the food chain, this animal must have had a prodigious appetite that would have required a highly productive source of food. The extensive and thick deposits of shallow water Middle Miocene limestones that were deposited on the continental margins of all continental land masses confirm this high carbonate productivity and may help explain how the deep re-entrants could be fill in a relatively short period of geologic time. Eberli and Ginsburg (1987) have related the series of prograding off lapping beds seen at a two-way travel time depth of 0.6 km/sec on the seismic profile shown in Fig. 8 to the fluctuations in sea level, described by Haq et al., (1987) and Vail, et al. (1977). In view of the Bahamas' checkered and complex geologic history, the most striking aspect of this carbonate complex is its vertical scale. Both the thickness in section of shallow water and prograding slope carbonates continually deposited from Jurassic, and the depth differential between the platforms and the empty and/or filled oceanic re-entrant deeps are greater than any other carbonate platform known from the geologic record. Comparison with Atlantic abyssal plain sediments just east of the platform complex suggests that preferential subsidence has occurred under the platform. This may be a function of the location of the platform complex at a continent/oceanic crust margin, and perhaps only in this situation is the potential for such massive crustal subsidence and carbonate progradation found. The Bahamian platform does have one unique feature in that it is also bounded by the Puerto Rican Trench, an area of subduction further to the south. It is speculated that the transition of the Northern Puerto Rico trench from a region of subduction to one of strike slip movement was due to the inability of the trench to "swallow" the lighter carbonates in a subduction zone (Ref.). The massive thrust sheets on north Cuba support this contention. In short the carbonates refused to be "flushed-down" the trench's throat. However unique the Bahamian platforms may appear relative to their thickness, there are many examples of ancient carbonate platforms with the same general construction, i.e., shallow flat-topped platforms separated by steep-sided narrow basins or re- entrants that are filled by the local progradation described by Eberli and Ginsburg (1986). Examples include the upper Devonian of the Canning basin, Western Australia (Playford, 1980), the upper Devonian of Western Canada (Stoakes,1980), the Permian of western Texas (Newell et al.,), the Upper Jurassic and Lower Cretaceous of the Neuquen basin in Argentina (Mitchum and Uliana1988), the Mesozoic of the dolomites (Bosellini et al.,1980, Bossilini 1988) and the Appenines (D'Argenio et al 1975). The same type of structural control on basin and platform configuration can be postulated, although the underlying basement is likely to have been different. Thus, the same principles of sediment distribution, the processes of formation, environmental and geochemical constraints and oceanographic mechanisms of geological formation should be as applicable to ancient platforms as they are to the Bahama complex. It is this supposition "that the general principles of carbonate sedimentation" have prevailed through geological time that permits using the Bahamian sedimentary relationships as a comparative model for Holocene and older shallow marine carbonate deposition. The paleoceanographic conditions would still depend on the circulations of the winds and the configurations of the surrounding land masses, it is thus the "fun" part of any comparative study to try and determine these relationships and the constraints one must put on developing the model.